In April, GLIDE unveiled a prototype of GLIDE Goods, a no-cost store offering everyday necessities to those in need while informally engaging individuals and families who might benefit from other GLIDE programs. Set inside Freedom Hall in GLIDE’s 330 Ellis Street building, and due to open permanently in May, GLIDE Goods has emerged from a productive partnership with the community-focused, mission-driven design group Adaptive Path (www.adaptivepath.com). Launched in 2015 as an initiative of Capital One, Adaptive Path is a platform for designers, design managers, event planners, financial whizzes and creative geniuses that re-envisions how we apply design to engage with communities. This partnering effort with GLIDE was a natural opportunity for the folks at Adaptive Path to discover how collaborative community-based design work might make meaningful contributions to the delivery of critical services. GLIDE is honored to have been chosen to partner in this important work, which is already pointing to exciting possibilities for furthering the impact of the organization’s programs and mission. The small things most of us can take for granted are often debilitatingly inaccessible to people living on the margins of our society. 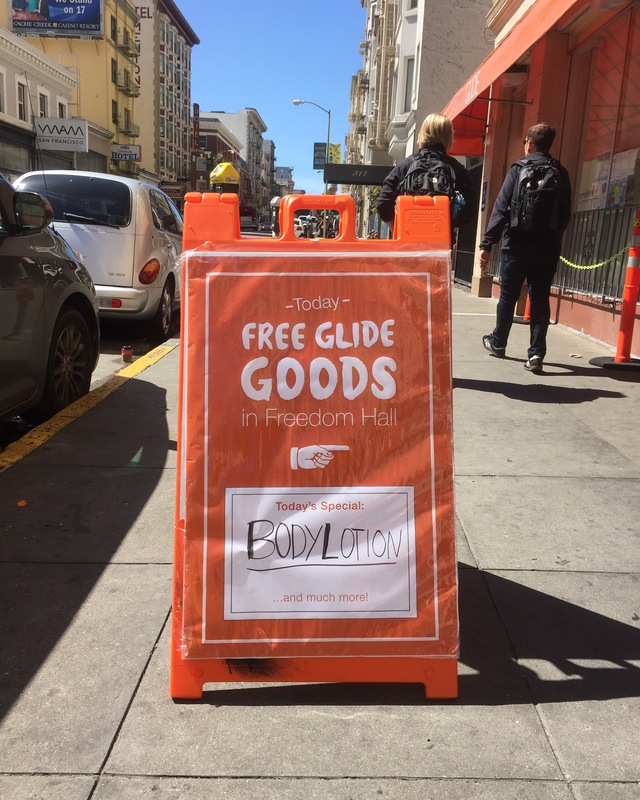 Items available at GLIDE Goods include toiletries such as toothpaste, toothbrushes, combs, sunscreen, feminine hygiene products as well as other basics such as socks, rain ponchos, warming blankets and earplugs. GLIDE Goods is a unique place for people to get what they need, while crucially offering the chance for deeper relationships with those who can help them move beyond crisis and instability. But we need continued support from our wonderful donor community to keep the shelves stocked with products. GLIDE is currently running a donation campaign on Roonga (www.roonga.com/glide) where a donor can choose specific items to contribute to our inventory. Our friends at Roonga are providing this lovely, and loving service, which provides a simple means for donors to directly help the members of GLIDE’s community. Please consider contributing to GLIDE Goods today! And thank you for your continued support as the store continues to grow.